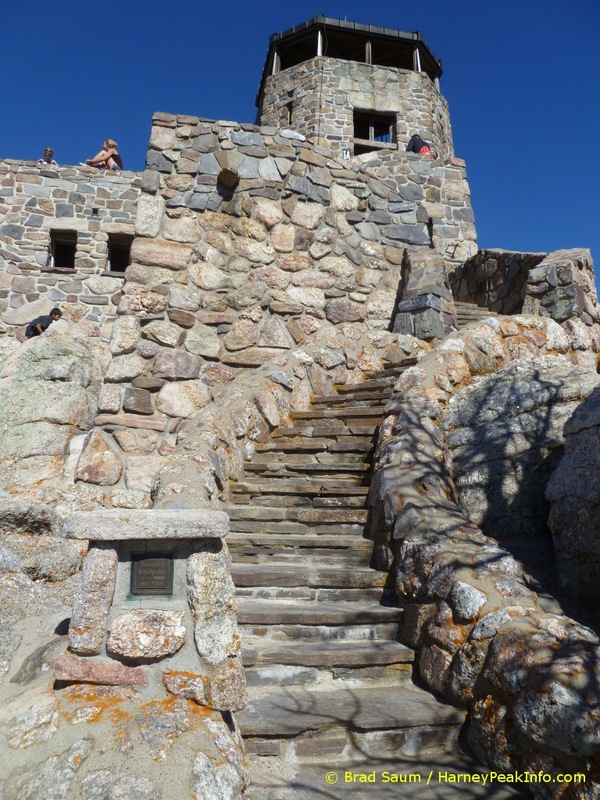 The Harney Peak Fire Tower was built by the Civilian Conservation Corps from 1935 to 1938. Stones gathered from French Creek were used to construct the tower. All of the building materials were hauled by man and mule along the three mile trail to the summit of Harney Peak. The lookout tower, dam, pump house and stairway were constructed upon the highpoint. The reservoir created by the dam supplied water to the living quarters which were located in the lower level of the Harney Peak Fire Tower. The comforts of electricity, flush toilets, and a central heating system were incorporated into the remote Harney Peak Fire Lookout Tower. The summit of Harney Peak with the commanding view of the Black Hills was first used in 1911 as a location to watch for forest fires. The stone fire tower constructed by the CCC was specifically engineered for the granite summit. Harney Peak Fire Tower was staffed until 1965 by the U.S. Forest Service, and then for the following two years by Custer State Park. A watchful eye was placed across the surrounding Black Hills looking for smoke rising from a forest fire. Airplanes, helicopters and other fire towers throughout the Black Hills National Forest, resulted in the Harney Peak Fire Tower no longer being staffed after 1967. Providing excellent panoramic views of the surrounding pine covered landscape, the Harney Peak Fire Lookout Tower remains at the summit, and is open to those who hike the Harney Peak trail to the summit. The summit and Harney Peak Fire Tower reside in the Black Elk Wilderness Area, and are only accessible on foot or horseback. The typical trail to hike to the Harney Peak Fire Tower begins near Sylvan Lake in Custer State Park.